In the European cultural field at the end of the 1990s, two new phenomena were to make their stage appearance. On the one hand, the creative industries approach was developed, first in London through the infamous white papers of the Department of Culture Media and Sports (DCMS) under New Labour, and not much later through the work of Richard Florida. It was a response to the increasingly central role of cultural production in the economy, a development neatly synthesized by Amsterdam’s überplanner Zef Hemel: ‘The economy is becoming increasingly cultural, and culture is becoming increasingly commercial.’ With the creative industries policy, a new entrepreneurial approach to culture and the arts was born, which would set out to conquer large parts of Europe’s cultural policy apparatus. Artists and cultural workers themselves, now described as ‘cultural entrepreneurs’ or ‘creative class’, were proclaimed as role models of the new economy. They were said to embody the new work ethic, based on flexibility, entrepreneurialism, networking, the ability to deal with uncertainty, lifelong learning, creativity, innovation and so on. On the other hand, there was the resurgence and international popularization of radical theory. One current gained particular prominence, epitomized by the success of the book Empire by Antonio Negri and Michael Hardt. This current is known under many names, some call it post-operaist, others post-autonomia, others sympathetically label it ‘heretical Marxism’. In many ways, this school of thought anticipated and theorized the abovementioned economic transformations and that of labour subjectivity more broadly. Through a series of conferences – such as DASH, NEURO, DOCUMENTA XI – post-operaismo became the lingua franca of a politically engaged subscene in the European art world. The presence in 2009 of some of the main post-operaist stars at Tate Britain – Maurizio Lazzarato, Judith Revel, Franco ‘Bifo’ Beradi and Antonio Negri – to discuss the relation between art and labour, is evidence of its still growing popularity today. In the Netherlands, the first development has come to define the new standard in the cultural sector. Planners and policymakers, and even artists themselves have largely adopted the entrepreneurial mindset as proposed by Florida and New Labour. The second phenomenon, however, has never caught on, leaving us with little analytical tools to come to a critical understanding of the transformation that has taken place. This challenge has now been taken up by art sociologist Pascal Gielen, who in two recent books, The Murmuring of the Artistic Multitude, and Being an Artist in Post-Fordist Times (edited with Pascal de Bruyne), has made an attempt at introducing some of the post-operaist lexicon to the Dutch art world. 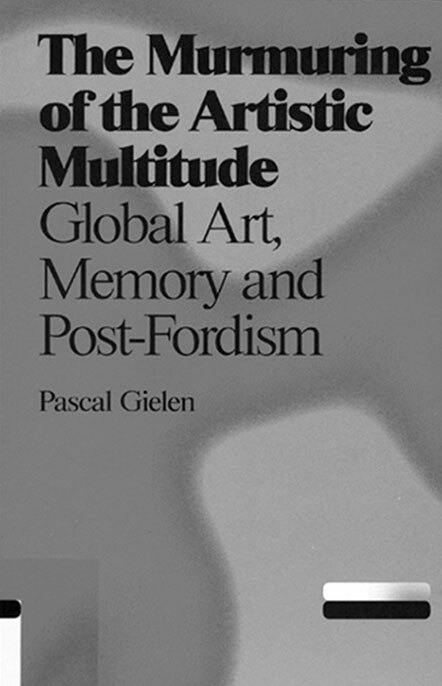 The central subject Gielen elaborates on in his books, is that of post-Fordism. The concept basically describes the new flexible economy that has supplanted the old industrial mode of production – Fordism, a term coined by Antonio Gramsci and named after the factories of carmaker Henry Ford. Under Fordism, there was the figure of the mass worker, appointed with a pretty brainless and repetitive task – think of Charlie Chaplin’s Modern Times. Under post-Fordism, the creative and communicative skills of the worker have become much more important to coordinate an ever more complex, decentralized and dynamic production process. It is nicely summarized in a quip by the Italian philosopher Paolo Virno, who refers to the signs hanging on the walls of the factories of old: ‘Silence, work in progress’. In the new spaces of production, he suggests, it should read ‘Work in progress. Speak’. The essay compilation The Murmuring of the Artistic Multitude covers a series of topics, starting out with post-Fordism, passing through memory and heritage, towards the globalization of art and the biennials. Gielen introduces some of the basic Italian post-operaist concepts, (relying mostly on the work of Virno and staying well clear of Negri’s more messianic approach): post-Fordism, Multitude, Biopolitics, Virtuosity, Opportunism. In the memory and heritage section, he uses the work of Goffman to analyse the relation between art and memory, giving mostly Flemish examples. And lastly, focusing on the biennales, Gielen relates some interesting interviews with key Belgian curators, Jan Hoet and Barbara Vanderlinden, and develops a scheme to interpret the new rules of the globalized art system, relating it back to the art-sociology of Heinich and Bourdieu. The edited volume Being an Artist in Post Fordist Times, is a combination of essays by different authors (Michael Hardt, Rudi Laermans and Paul de Bruyne) – and interviews with leading contemporary artists such as Michelangelo Pistoletto, Anne Teresa de Keersmaeker, Pippo Delbono, Matthew Herbert, Thierry de Cordier, Sang Jia en Pun Siu Fai. However, the setup with the essays and the interviews does not seem to work very well for the editors, with most of the artists having their own phlegmatic and eclectic positions, bearing little relation if any, with the post-Fordist zeitgeist Gielen and de Bruyne are trying to discuss (though granted, Gielen does refer to the post-Fordist embrace of idiosyncrasy). In comparison with the well-crafted The Murmuring, this book is decidedly more unbalanced. Echoing the work of French sociologist Luc Boltanksi, Pascal Gielen’s central thesis is that the art world has acted as a sort of behavioural laboratory where the creative behaviour that is now standard requirement in post-Fordist capitalism was first developed. The central role of art and culture in the new economy has therefore been long coming, suggests Gielen. He cites Virno, stating that ‘art has been diluted in society like a soluble tablet in a glass of water’. Accordingly, Gielen’s mission is to find out what to do with this newfound economic and cultural centrality of the arts. What is to be done with a soluble tablet? Having seen the art practice change from a rather marginal affair to that of semi-professional practice, and he himself residing over an impressive growth of art students as lecturer on Art and Society at the Fontys art school in Tilburg, Gielen tries to map out the consequences of the professionalization of the arts for artistic autonomy and practice. It’s a spirited search for cracks, tears and holes, in which a critically engaged art practice can survive and thrive. Finally, as Gielen explains, murmuring is a extralinguistic vitalistic buzz, a form of resistance, a way of being that can makes itself heard while escaping recuperation and cooptation. Let’s hope this multitudinous buzz keeps on buzzing, distributing itself along the fault lines in the arts system and society at large. Let’s spread the buzz. Merijn Oudenampsen (1979, Amsterdam) is a sociologist and political scientist. He is affiliated to Tilburg University, doing a PhD research project on political populism and the swing to the Right in Dutch politics. He was guest editor of the 20th edition of the art journal Open, titled the Populist Imagination (NAi 2010). He edited a volume titled Power to the People, een anatomie van het populisme (Boom | Lemma 2012). His essays and other texts are archived on merijnoudenampsen.org.